A Great way to share your love of quilting is to join an online quilt group to get new patterns, ideas, and advice on quilting. There have been more than enough times when I have missed my local quilt group. Sometimes we all can have an overly busy schedule. Making time for a meeting just isn’t in the cards. I get behind on projects from the group, miss out on steps…. kind of frustrating! If this sounds like your life (or maybe you aren’t even close enough to a group!) I have something I’d like to introduce you to. The International Association of Quilters, or the Online Quilt Group. They are a quilt group membership….with over 600 members from around the world. In fact, the members represent 21 countries and 41 states! If you are into monthly projects, a community of quilters and a variety of techniques- the IAQ is something you should look into. Membership for 1 year of access (access includes 2015, 2016 & 2017 patterns) for a low price of $45. This is what stands this online quilt group or the online quilt group apart. They have a planned year for you. Every month there is a project. Every month you are introduced to a designer that is from all over the world…..maybe some you know and others you don’t! Plus, they share a pattern as well! There is of course a Block of the month. I mean, what quilt group doesn’t have one of those?! They make sure you have an opportunity to be involved together through swaps, challenges, and show and tell. The forum in the group area or the fb private group allows you to quickly connect, share pictures or ask questions. 1. BECOME A MEMBER-- Dues are $45 / year. Billed yearly. 2. LOGIN & SEW-- you’ll find ALL the patterns in one spot…. Easy to find a project and get sewing! Nothing is kept from you. 3. PARTICIPATE -- return during the first full week of the month to see the new patterns, get to know the guest designer, attend the ‘meet up’ day & more. Just in case you are wondering-- you can login anytime. Don’t stress about it- when your schedule allows you pop in. You can pick and choose from the projects and decide what to sew along with. What does it include? At least 15 patterns are coming during 2017….that does not include the last 2 years of projects (which you’ll have full access to) The projects are a little bit of a mystery-- but know that they will include - a pincushion, table runner, doll, mini quilt, mystery quilt, block of the month, bag just to name a few. It’s loaded with over 40 patterns from previous years all ready for you to start sewing! It’s online- no leaving your home, packing your bags or Missing out if your schedule gets busy! I have sure enjoyed the group and look forward each month to the new projects and designers --- I’m sure you will too! It’s a great way to explore new designers, patterns and meet others. 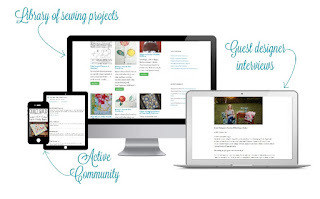 It works with your schedule plus gives you projects you can start sewing right now.